If you are looking for a dish that’s easy to whip up and can be saved for the next day without compromising on taste and flavor, then here is it. 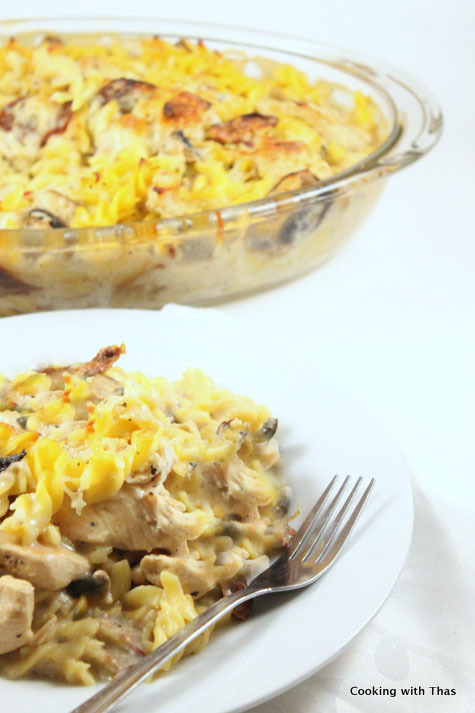 Go ahead and make a huge batch of this baked pasta with chicken and mushrooms, refrigerate the leftovers and it will taste mighty delicious the next day. 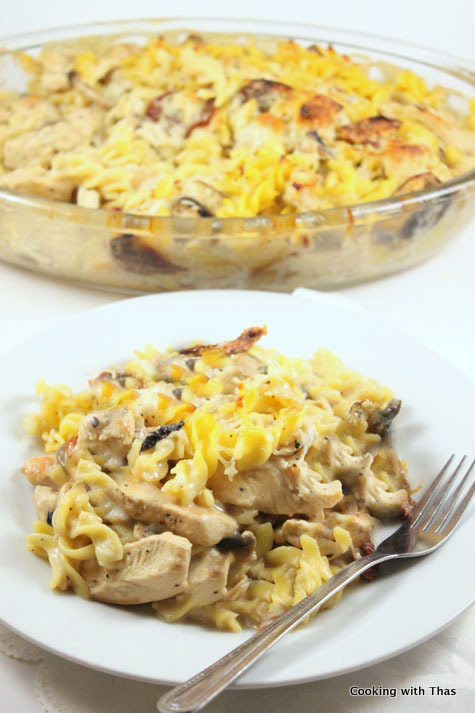 I adore the combination of pasta and mushrooms, if it has chicken and if it’s baked and is made in a creamy white sauce, then don’t ask me how much I love this. I lack words to express it, I can definitely show you by finishing up the whole platter. Cook pasta in boiling water along with little salt till it turns tender. Drain the water and keep aside the cooked pasta. Heat a non-stick cooking pan over low medium flame, add olive oil. Place chicken breasts on the oil, sprinkle with ground pepper and salt. Cook uncovered till the chicken has almost cooked and outside turns light golden in color. Slice the cooked chicken breasts into long strips and keep aside. Place a large pot or dutch oven over medium heat, melt the butter in it. Add the flour and garlic, whisk constantly breaking the lumps till the flour turns light golden in color. Now, slowly add the milk and whisk it constantly, let the flour dissolve in the milk. Add the dried oregano to the milk and simmer for a few minutes. Now, add the sliced mushrooms to the milk, cook for a couple of minutes. Remove from the heat and stir in the parmesan cheese 1 1/2 cups to it. 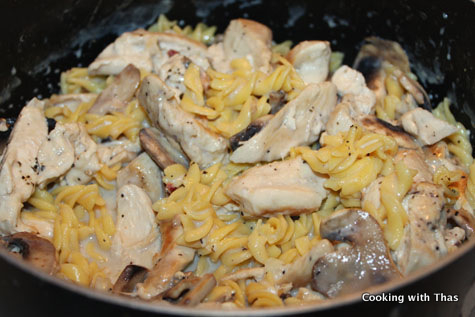 Add the cooked chicken and pasta to the mixture. Sprinkle some ground pepper and salt over it. 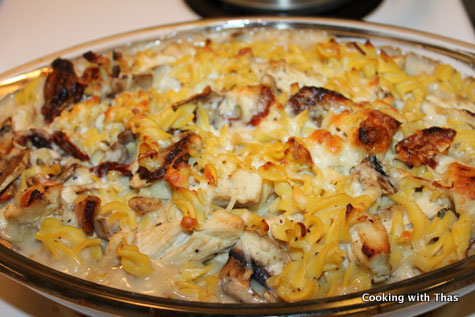 Combine the pasta and chicken well. Grease a large glass baking dish with butter or you could use two medium sized dishes. Pour the mixture onto the baking dish. Sprinkle 1/2 cup parmesan cheese on the top and bake it uncovered for 25 minutes. The cheese will turn golden in color and the mixture will be bubbling. Remove from the oven and let stand for a few mintes. Serve warm on a plate. Refrigerate the leftovers and it will taste delicious the next day. For making it gluten free: Use gluten free flour instead of all purpose flour. You could adjust the amount of cheese accordingly. Remove from the heat and stir in the parmesan cheese 1½ cups to it. Sprinkle ½ cup parmesan cheese on the top and bake it uncovered for 25 minutes. 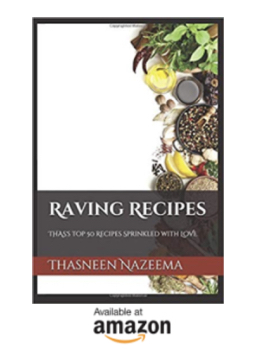 •For making it gluten free: Use gluten free flour instead of all purpose flour. •You could adjust the amount of cheese accordingly.